So, since I load the rifle a tad hotter, along with a longer OAL, I use plated brass for the rifle, and brass brass for the pistols. Makes Identification easier, (actually more positive), and contrary to all I have heard, I NEVER have any problem with extraction of a split case, or for that matter any problems what-so-ever with the use of Nickle Brass in the rifle. I buy once fired range brass, both brass and nickle very cheap, so more frequent splitting of the nickle cases is of no real consequence in the long run. It runs thru the Marlin flawlessly, Is easier found by the brass shaggers, and is more easily identified by the shooter. I, like Buck D Law, find it works just fine, and it presents absolutely no problems for me. I took a tour of an ammo plant a few years ago. This was a big plant where they actually made the brass they were loading. I specifically asked about nickle plated brass and whether it was more brittle than plain brass. They said nickle brass was primarily for situations where ammo is carried a long time and not used much. I.e., like many police officers. The nickle won't get verdigris or other damage like bare brass. They said the nickle plating process does embrittle the brass, but that for its intended purpose (one shot and throw it away) it was not a problem. cases. I only use the nickle plated brass in the pistol, NEVER IN THE RIFLE! I started with all brass 357s. As time went by, I accumulated some 38spl brass(usually happens when some pard brings your brass and dumps 'em in your brass bag). So on occasion, I would trade with a pard who has accumulated 357s in the same manner. And that's when I started using nickel casings. Unfortunately, I've had bad luck with them(the latest was shooting clean so far in an annual then #3 bullet case splits in your rifle and jams it! ), so I now use 'em exclusively on pistols. Because my pistol loads are different than my rifle loads........so it's easy to identify them. I use the nickel in the pistol because they split more. People will say all kinds of stuff about them being the same, different, harder, etc. I'm not in the brass business and I didn't even stay at a Holiday Inn Express but I can tell you this........for every split brass case I find I will find 3 or 4 split nickel. shoot I just like the way it looks! Looks Great in the gun belt !!! The experience that I have had with nickel vs regular brass is this. My wife shoots a Marlin, when I loaded regular brass and they would split, in the rifle, they would jam the rifle due to they way that they (normally) split. When we use nickel they tend (not always) to split differently and do not NORMALLY jam the rifle. As to whether they split sooner or not, I do not care, what I do care about is keeping the wife person happy. If that means using nickel vs brass, so be it. It's important to remember that although brass will reload more times than nickel, it WILL eventually split. If a reloader's inspection process doesn't catch the split case BEFORE it gets reloaded and put in the rifle, it IS going to cause a problem when the bullet gets pushed into the case by the magazine spring. I use a nylon doo-rag (skull cap) to inspect my brass (actually Sugah does the brass inspection), but I've heard that ladies stockings work well. Either will find even the slightest beginning of a crack. Sometimes I have to get a magnifying glass to see what the doo-rag snags on. I'm guessing that most of the nay-sayers on here are shooting .38/.357. or some other straight walled case with smokeless powder. I too have experienced numerous split cases using smokeless powder with nickel .38 specials of a variety of headstamps except Starline. 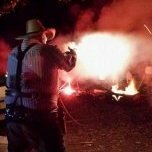 I normally shoot blackpowder rounds in a .44-40 '66 carbine or '73 short rifle using Starline nickel cases without incident. I lose many more cases to the brass gods than I do to split case mouths. Bottom line IMNSHO is it depends on what powder, caliber, manufacturer's cases and loading procedures you are using that determines the frequency of split cases. I only use new or once fired Starline at EOT, WR, or Regionals. Everywhere else I use Federal or Speer. I only use Winchester and R-P for practice. In all the years I have NEVER had a nickel case split and jam a rifle. I have noticed that nickel brass does seem to split more often than "brass" brass but, like someone posted earlier, I've seen the splits mostly along the side and not at the mouth of the nickel brass....I'm not sure why it fails that way more often though. I purchased 500 starline nickle plated brass to shoot out of my RNVs, my rifle and other match pistols are 44 mag. The nickle cases make 44 vs 45 separation a snap. I started reloading in 2008, when I retired. Preparing for that, I had accumulated a couple thousand nickle and a couple thousand brass cases, all reloaded at least once (.38 spl). Also bought a thousand Starline brass, planning to eventually go to it once the used stuff wore out. Figured I'd use up the nickle first, since I had heard how it splits so easily/much. Am still using it. A lot of it has about half the nickle worn off but it's still usable. Have been seeing about 1 or 2% splits, although it's now getting up to about 5%. I inspect before lubing & putting into the hopper and again after loading, throwing away any with visible split. I think a lot of the splitting happens because of the flaring and sizing. I bell the case only minimally, just enough to hold the bullet and not shave lead. I also load to the upper half of the loading charts, FWIW. Nickel brass with a cannelure is not your friend in a rifle. There is a tendency to split off and remain in your chamber. Once burned, I guess - my first foray into new nickel brass was with RP. Never again. Agree with most said in thread. I like nickel for BP, brass for smokeless in order to keep separate. Since I do find nickel to crack more I inspect each match round that is for rifle, chamber gauge it, and mark it with red mark. Small cracked brass seems to be fine in revolvers. I am in the process of culling all the nickel out of my 38 cases after having several split during practice. the quality seems to be all over the place with the plating. As has been stated, I have some that have been reloaded so many times that the nickel plating is wearing off! Others don't make it 5 reloads. I use them to set up the belling on the reloading press. I see to cringe less when I over-bell, crush or otherwise destroy a nickel case. I use .38 nickel cases in my revolvers; care less if they split. Can tell them from my brass cases of which I only use Starline in my rifle, adding about 1K new ones a year. I trade the other brass headstamps for nickel. I also use nickel cases in .44 Russian and Mag. for BP matches; total two a year. The MD and PA BP championships. I used to use the nickel in my pistols and like you said no big deal if they split. But when the nickel wears off it gets hard to tell them apart. So last year I threw them all out. Not worth it in the long run. I use nickel cases for my BP loads. Bdoc shoots smokeless and we only use brass for those so we can tell at a glance if it's smokeless or BP.